Giverny. During the day, tourists flock to the former home of the famous artist Claude Monet and the gardens where he painted his Water Lilies. But when silence returns, there is a darker side to the peaceful French village. Entangled in the mystery are three women: a young painting prodigy, the seductive village schoolteacher and an old widow who watches over the village from a mill by the stream. All three of them share a secret. But what do they know about the discovery of Jérôme Morval's corpse? And what is the connection to the mysterious, rumoured painting of Black Water Lilies? I was absolutely gobsmacked by the ending of this book. Nothing had prepared me for the way the author had played with various time frames, and with my mind. Initially I was left feeling that perhaps I hadn't read it carefully enough. But then as I looked back over the pages I could see how he had done it. We see most of the book's action through the eyes of an elderly woman, a recluse who lives in the water mill next to stream that runs through Monet's Garden. She lives on the 4th floor, a vantage point that allows her to observe most of what goes on in the small village. Nothing escapes her attention it seems. We are so taken up with the investigation into the death of Jerome Morval and the possibility of a lost Monet painting that we don't recognise the signs that our path meanders. I wonder if the author has played fair with the reader? What strikes at the end though is that the novel is itself a tribute to impressionism. 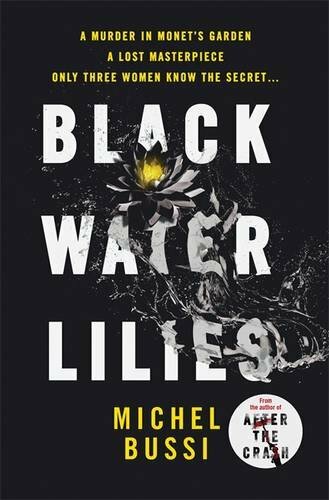 Michel Bussi (born 29 April 1965 in Louviers, Eure, France) is a French writer of detective novels, and a political analyst and Professor of Geography at the University of Rouen, where he leads a Public Scientific and Technical Research Establishment (French: Unité mixte de recherche, "UMR") in the French National Centre for Scientific Research (French: Centre national de la recherche scientifique, "CNRS"), where he is a specialist in electoral geography. According to the Le Figaro/GfK list of bestsellers, he was one of the ten bestselling French writers of 2013, selling around 480,000 books.